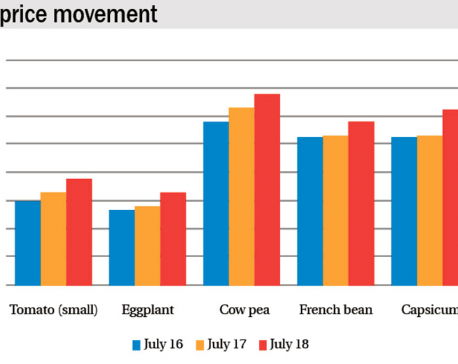 KATHMANDU, June 24: Price of vegetables has gone up significantly over the past week. While retailers attribute the price hike to erratic supply in the market due to monsoon rains, officials of Kalimati Fruits and Vegetable Market Development Board say price has gone up as traders are keeping high profit margin. “We have seen significant rise in the price of vegetables at the Kalimati Fruits and Vegetable Market, from where we purchase vegetables, over the past week. Price of some vegetables has doubled,” said Keshab Parajuli of Kali Gandaki Store – a vegetable retailer based in Bhotebahal, Kathmandu. He, however, has no idea what is causing the prices to go up. Parajuli also claimed that price of vegetables purchased by the board is not correct. Another retailer, Mahendra Thapa of Sanepa, told Republica that vegetables supply has dropped in recent days. “While some vegetables like tomato, potato and onions are available in abundance, supplies of other vegetables like cauliflower, cabbage, lady's finger, green beans and pointed gourds have come down. This could be the reason behind the surge in vegetable prices,” said Thapa. Binaya Shrestha, deputy director of the board, accepted that vegetables prices have gone up significantly in recent days. “Traders say price has gone up due to drop in supplies. But supplies have not gone down much,” he says, adding that it is natural for supplies to fluctuate during monsoon season. 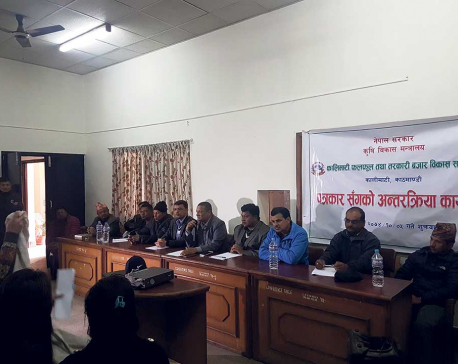 “The market at present is receiving 600 to 650 tons of vegetables per day which is a bit down compared to average daily arrivals of 700 to 750 tons,” Shrestha said, adding that it alone would not create such a significant price hike in the market. According to traders, price of vegetables available at around Rs 50 per kg before monsoon has now soared to Rs 60 per kg or higher. Some vegetables like beans, long beans and cauliflower have witnessed even higher price hike, they added.